This postcard was issued to celebrate Winnie Ewing becoming the first woman Nationalist MP in 1967. 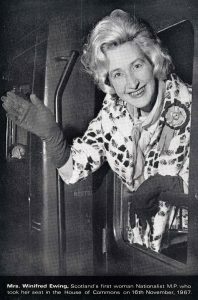 Mrs Ewing’s victory was described as “the most sensational by- election result in Scotland since 1945” and a “watershed” moment in Scottish political history. The victory of the SNP represented a major shift of 32% away from the Labour Party in what was hitherto a Labour heartland. Even the SNP leadership did not expect a win and asked Mrs Ewing “try to come a good second in order to encourage the members”. Mrs Ewing said later that no one thought that she had a “snowball’s chance in hell” of winning the seat. The win at Hamilton bolstered the SNP and sent shockwaves round the other political parties who realised that the SNP now posed a significant electoral threat. Winnie Ewing served as MP for Hamilton until 1970 and went on to be elected as MP for Moray and Nairn between February 1974 and 1979 unseating the then Conservative Secretary of State. She represented the Highlands and Islands served as an SNP MEP for between 1979 and 1999 and was MSP for the Highlands and Islands between 1999 and 2003.